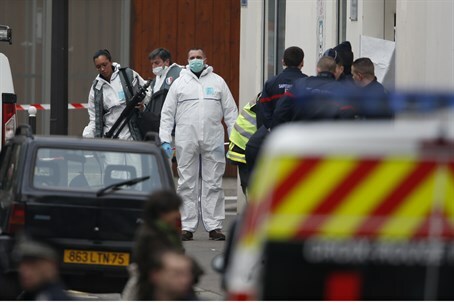 The youngest suspect in a deadly attack at a satirical newspaper's office in Paris has turned himself in. The youngest suspect in Wednesday’s deadly attack at the Paris office of the satirical newspaper Charlie Hebdo has turned himself in, French police said Wednesday night, according to ABC News. French authorities have named the three suspects who they believe are responsible for the shooting deaths of 12 people as Said Kouachi and Cherif Kouachi, two relatives both in their 30s, and 18-year-old Hamyd Mourad. It was Mourad who reportedly turned himself into police, but no further information about the suspects, including their whereabouts, has been released publicly at this time. The three masked men stormed the offices of Charlie Hebdo, which has previously been targeted over its portrayal of the Prophet Mohammed. A major manhunt was launched after the men fled the scene in a black Citroen, which was later found abandoned in north-eastern Paris. They then hijacked a white Renault Clio and drove off in the direction of the Porte de Pantin, one of the main routes out of the French capital, according to Sky News. Earlier Wednesday night, French police launched an anti-terror raid in north-eastern France after the attack on the newspaper. The AFP news agency reported that France's elite anti-terrorist unit had begun the raid in Reims.